It may be late in the summer and beach season's coming to a close, but don’t go thinking that fall means you need to pack up your coastal stylings just yet. Didn't you see the news yesterday? The surf is crazy. With swells shifting and the crowd of out-of-towners thinning, there isn't a better time to paddle out at your local break — given that your local break is one of these top spots. Aside from a mid-to-long-range walk from parking to the beach, and a handful of looks you'll undoubtedly receive from the protective locals, Trestles at San Onofre State Beach is one of the best setups you'll get in the US. Lower Trestles is home to the likes of Kolohe Andino and the Gudauskas brothers (as well as a personal favorite of 11-time world champion Kelly Slater), while Uppers provides a nice alternative if the "main attraction" is a little crowded. Spoiler: it will be. The only real problem with Trestles is you'll be paddling for position against what seems to be an endless processional of the best pre-teens in the area, their youth and sense of entitlement lending to countless snakes (getting cut off) as you struggle to keep up. Still, the few waves you do catch make it worthwhile. Pro tip: If you're new to the area, grab fish tacos in Encinitas (25 minutes south) on the way down to check out Black's in La Jolla, San Diego, even if only for a look — both will round out your exploration of the Southern California surf scene. Localism: Expect a couple salty looks and sideways glances. For the most part, the locals are friendly. Board: It's a forgiving set of waves, so anything from a groveler to a longboard -- and everything in between -- will work. Surfwear: You can trunk it until mid-October or so, then a 2/2 is suggested. You may think of Southern California as the Golden State's mecca for surfing, but you'll get a strong and convincing argument from the north that sunshine and bikinis are overrated. 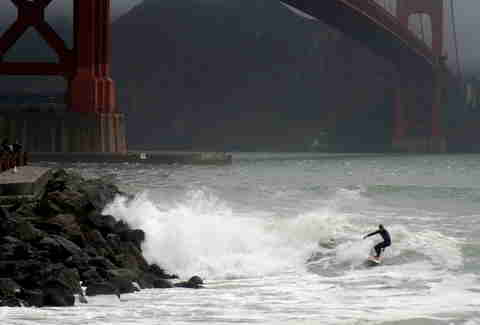 An American bastion for both cold-water and big-wave surfing — ever heard of a little break called Mavericks? — Half Moon Bay and the towns surrounding it breed the type of surfers who, with salt water coursing through their veins, don't need "a reason" to be out there. That's simply what they do – they surf. While Steamer Lane has the best waves with world class sets rolling through, Cowell's Beach is ideal for intermediates and much more welcoming. Need a tune up? Go to beginner-friendly Pleasure Point if you're looking to acclimate yourself to the cooler waters. Crowds: All day, every day. Localism: It exists. Bring your manners. Board: A fish, longboard, or anything wide and thick is recommended. Surfwear: A 3/2 will suffice now, but in a couple months you'll need the 4/3, and you'll eventually pull on the boots, gloves, and a hood in the winter. First, Second, and Third Points are all easy paddles. And for the most part, on a good day, they all offer easy takeoffs. Not so easy? Navigating the crowds. 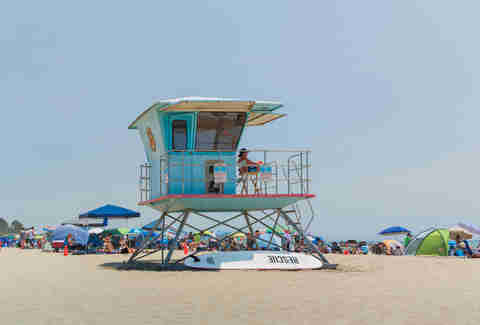 Located in what is technically North Los Angeles, Surfrider Beach is the perfect storm of locals who you'd swear never leave, fast-moving city folk grabbing a quick surf before work, or weekend warriors who refuse to let anyone/anything put a damper on their free time. However, this place is the stuff of lore (and Surfrider Foundation basically started here) and songs (literally, think Beach Boys) and is a break everyone should check off their list at some point. Summer makes for a great longboard wave while the fall and winter months offer up fun sets for the shortboard. Heads up: Right off the PCH, be sure to look before you leap — if it looks like a koi pond at feeding time, there are plenty of other spots all through Malibu and Ventura County is only a short drive up the coast. But don't hold your breath as those will likely be crowded as well. Crowds: A grocery store parking lot is less slammed. Localism: Less and less these days, but there are plenty of surly locals. Surfwear: You can trunk it right now, but come mid-October and you'll want a 2/2. Talk about a view. Tucked under the Golden Gate Bridge, you're not only in the presence of a massive behemoth that is a true testament to American industrialism, but surrounded by the actual Fort Point, a fortification erected during the Civil War. Whatever tropical or otherwise epic backdrops you've taken in before, this is a rare situation where both old and new -- as well as natural and manmade -- come together effortlessly. But be careful. The precarious, tight takeoff and rocky outcroppings waiting to greet you make this one of the more dangerous waves on the list. Also, avoid salty locals, if you can. Crowds: Can be packed on good swells. Surfwear: You could get away with a 3/2 now, but that will change soon. Be ready to pull on the thick neoprene replete with boots, gloves, a hood and maybe some vaseline for exposed skin in the winter. Didn't see many waves this summer? Of course you didn't. The swells weren't right. The East Coast is all about season and swell, and it's about to be high noon in New York. While Montauk and the Hamptons are better known for glitzy soirees and sharehouses full of yuppies, the end of summer means the end of cramming into a train with anyone who found a square foot of "bed" to claim for the weekend. Now, the only company you'll keep out there is good company: locals and those who have the commitment and conviction to work odd jobs during the off season in order to welcome the waves when they do come. And, oh boy, do they ever come. Need another reason? Shellfish season is about to be in full bloom. Don't forget your oyster knife! Break Type: Rocky righthander that breaks off a jetty. Localism: If you encounter any, I'd be surprised. Board: Anything you'd like! From a fish to a thruster to a longboard, it can all work here. Surfwear: Trunk it now because you'll need increasing amounts of neoprene in the coming months. While New Jersey seems to always play second fiddle to New York, the Garden State is quickly asserting itself as the preeminent surf of the Northeast. Though it might suffer from something of an identity crises, make no mistake — this place comes alive when the winter swells wake up. The Jersey Shore pumps thick barrels. But this stretch of coastline is all frigid temps and heavy beachbreaks, so you better bring a big pair of balls with that 5-mil. Crowds: Fairly uncrowded. You won't be the only one out, but you won't be shoulder to shoulder either. Localism: Not much to speak of. If you're respectful, you'll have a blast. Feeling fancy? 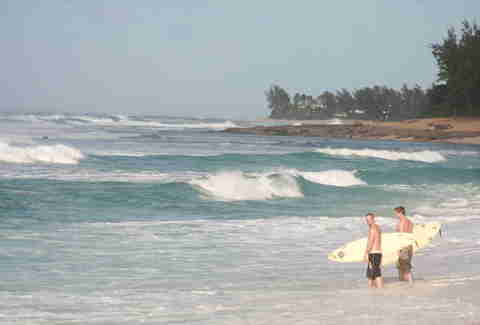 Why not surf off ritzy West Palm Beach? Yep, Palm Beach. The break offers mainly mid-sized barrels that go on for days. The locals are cued in, so don't think you're simply hob-nobbing with cash-rich kooks -- leave the expensive new gear at home. No one is going to be impressed; in fact, they'll probably respond quite the opposite. Bring a good attitude instead and they might give you a couple pointers, helping you find a crystal clear tube to slip into. And although the wave is fickle, when you get the right swell, it BLOWS UP. Crowds: Anytime there's a semblance of swell, everyone and their mother gravitates. Dismiss dreams of empty barrels. It ain't happening. Localism: A bit, yes, but the sharks are more intimidating. Unless you're put off by trust fund kids whose bark is worse than their bite. Board: Your favorite thruster would be the advisable move. Surfwear: Trunks! It's practically bath water. This is arguably the most consistent surf on the East Coast, even more so than Jersey (though the Garden State has had a couple of winters, as well as this current summer, to remember). Looking for barrels? Chase a swell — any swell here and you're almost guaranteed to get shacked. Cape Hatteras is known as the Graveyard of the Atlantic and the nickname lends itself to the dangerous break as well, especially come hurricane season. Pit stop: The nearby town of Kill Devil Hills is the quintessential Southern surf town, and there's nothing like all the sweet tea your heart desires with a little R&R following a day in the water. Crowds: Can be crowded on the weekends and in hurricane season (now), but usually it's not bad during the week. Localism: You could very well get a stink eye or two. Smile and let the locals get theirs. Board: Your favorite thruster or four-fin setup. Surfwear: Trunk it now because you'll need increasing amounts of neoprene in the late fall/winter. Remember how Kelly Slater loves Lowers? 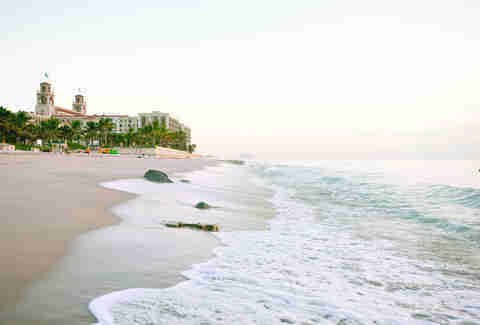 Well, Sebastian Inlet is his actual "home" break — though to be fair, he's pretty much ingratiated himself as a "local" the world over. Similarly to Lowers, the break has become something of a sideshow with the pros and pros-to-be arriving in flocks. 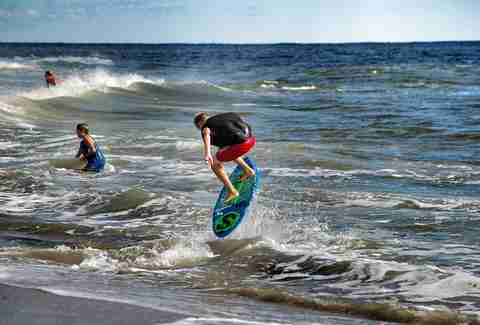 Best in late summer and early fall, these fast sets are often considered some of the birthplaces of aerial surfing (whereas Lowers might be considered aerial surfing's teen years). This is, without question, the training ground for the Southwest's best. Break Type: Sand-bottomed right that breaks off a jetty. Crowds: Slammed in the summer with tourists, locals, sharks, and plenty of Kelly Slater wannabes. Localism: Oh yeah. The locals aren't stoked on the crowds that gravitate towards this well-known break. You simply cannot have a list of best surfing beaches in the United States (or the world for that matter) without including Hawaii. And while Oahu's famed north and south shores get most of the attention, the islands of Maui and Kauai shouldn't be ignored. Kauai gave rise the some of the best competitive and free surfers in the world — including none other than legendary three-time world champion Andy Irons, the one man to rival Kelly Slater. And Maui has Honolua Bay and Jaws, one of the most popular big wave spots at the moment and a place you go to overcome fears and conquer dreams. 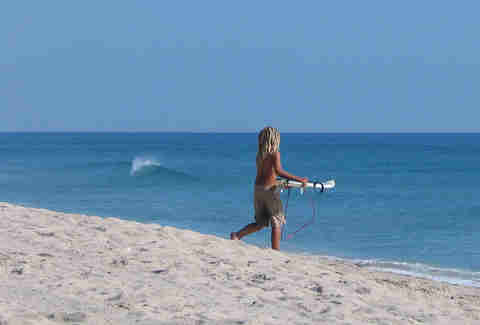 Then there is Ho'okipa on the north shore. If you know how to deal with the wind (Maui is very well known for kite and wind-surfing), then there are plenty of chances to catch great waves before you spend the rest of the day kicking around Paia. Break Type: Right pointbreak that breaks over reef. Crowds: Go ahead and dismiss any dreams of uncrowded tropical barrels right now. Localism: Heavy localism. Leave your ego in the car... or forget it completely. Board: Anything goes here, but I'd recommend your favorite shortboard as this wave is a bit ledgey. Surfwear: It's tropical! Trunks, for sure. 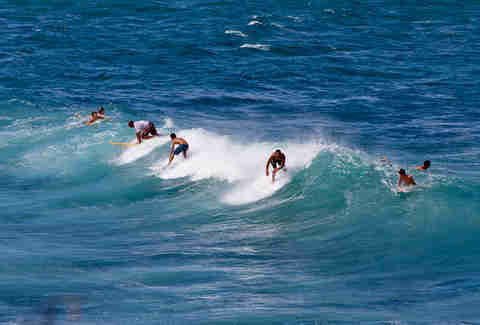 Winter Pipeline (right off Ehukai Beach Park) is the most famous reef break in the world. Sure, there are plenty of others that attract swells and surfers alike, but this is where it began. Pipeline is NOT for beginners. Pipeline is NOT for intermediates. Pipeline is NOT for experts. Pipeline is for a specific sort of surfer who has not only proven himself at reef breaks in the heaviest of conditions the world over, but has also proven himself to the North Shore locals who congregate in the lineup. And this isn't simply to ensure right-away or pecking order — it's largely to make sure you're not out there making a dangerous mess for everyone, including yourself. Pipeline is only one break among Hawaii's hallowed seven-mile miracle. This is merely the promised land. Break Type: Sand-bottom beach break. Typically more rights than lefts. Crowds: Not too bad this time of year, but the closer to winter it gets, the more people you'll find. Localism: Yes, indeed. Be respectful and let the locals get theirs. If you're patient, you'll get yours. Author's Note: When paddling any of these breaks, local or otherwise, there is one "rule" to abide by, above all — respect. Respect yourself. Respect others. And, most importantly, respect the wave. Be well aware of your own abilities and cognizant of your surroundings at all times. The water is the last place you want to be out of your depths.